Protista: Members of the kingdom Protista are eukaryotic. They consist of single cells or colonies of cells. This kingdom includes Amoeba. Paramecium, etc. Fungi: Members of the kingdom Fungi are also eukaryotic and multicellular. They also have walled cells. They are usually non-motile. Mode of nutrition distinguishes fungi from plants. Fungi are decomposers. Fungi digest organic matter outside the body and absorb the broken products. Animalia:Members of the kingdom Animalia are eukarvotic and multicellular. They feed by ingesting other organisms or parts or other organisms. Their cells lack walls and they are usually motile. Problem of study of fossils: Prokaryotic microbes were the only living organism during first two billion Years on the earth. There were very little fossil evidences from this early. Therefore, ribosomal RNA studies were used. The base sequences of ribosomal RNA of more than two thousand organisms were studied. It provides evidence about the relationships among the organism of this two- billion-year period. This study shows that the early five kingdoms do not follow the evolutionary lineages. Ribosomal RNA and evolutionary conservation: Ribosomal RNA is excellent for studying the evolution of early life on earth. It is an ancient molecule. It is present and retains its function in almost all organisms. The ribosomal RNA changes very slow E This slowness of change is called evolutionary conservation. Evolutionary conservation of means that closely related organisms have similar ribosomal RNAs. Thus there is a little change in the protein machinery of a cell. It still retains its vital function. Distantly related organisms have less similar ribosomal RNAs. But these differences are mach smaller. Therefore. the relationships to some ancestral molecule are still present. Archaea: These are prokaryotic microbes. ‘[hey live in extreme environment like high temperature rift valleys on ocean floor, or high-salt or acidic environments. All members of the Archaea live in anaerobic environments. These env ironments show the conditions of the earth at the time of its origin. The Archaea are the most primitive life forms. Ancient archoeans gave rise to two other domains of organisms. Eubacteria: These include true bacteria. These arc prokaryotic microorganisms. Eukarya: The Eukarya include all eukaryotic organisms. The Eukarya diverged more recently Eubacteria from the Archaea. Thus. 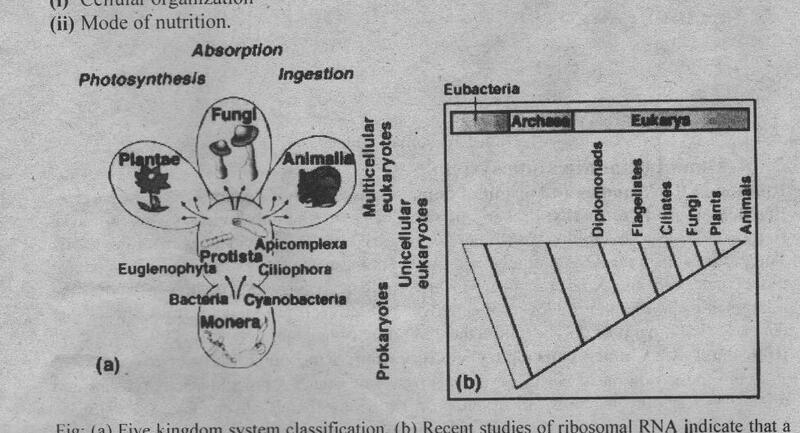 the Eukarya are more closely to Archaea than Fubacteria. The Eukarya arose about 1.5 billion years ago. Photosynthetic oxygen accumulated in the atmosphere. It results in the production of ozone. This zone covered the earth. Now, deadly ultraviolet light cannot enter into the earth. The Eukarya then developed further evolutionary diversification. It gave rise modern lineages of protists, fungi, plants and animals. 1. 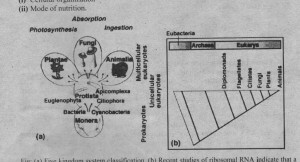 Traditional and modern approaches: A close relationship is present among all Eukaryotic organisms. But many biologists find the relationship among different domain as strange and unsettling. These relationships are new and are based on cellular characteristics. But the traditional taxonomists use the whole­-organism characteristics. The zoologists want more answers for accepting this system of higher taxonomy. 2. Status of protists: Animalia. Plantae and Fungi are still considered as kingdoms in this system. Then question arises, what is the status of Protists. The molecular studies indicates the separate protists lineage. Therefore, it should be given to the status of domain.